Your mission-critical projects need complex event processing, realtime management and monitoring. Talend 5.4 (released in December 2013, https://www.talend.com) offers a great new feature: Talend Event Logging. It allows logging, processing and monitoring of all technical events and business data. In this article, I will focus on how to process, filter and monitor business data. You can find more details about monitoring technical events and logs (e.g. OSGi events of the ESB container) in Talend’s documentation (www.help.talend.com). This new feature is very powerful, but also extendable to fit custom requirements. You can solve and monitor much more complex scenarios than the one I describe here. First, let’s take a look at the components / projects which are integrated and extended into Talend’s products for implementing this new feature. logstash (http://logstash.net) is a tool for managing events and logs. You can use it to collect different (distributed) logs, parse them, and store them for later use. 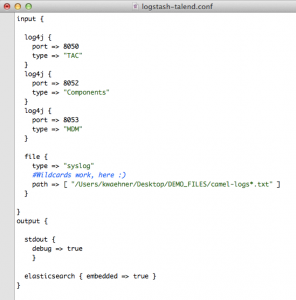 Speaking of searching, logstash comes with a simple, but fine web interface for searching and drilling into all of your logs. It uses ElasticSearch under the hood. So, you can easily query through all your logs for specific errors or business analytics (e.g. searching for all lines matching an unique order id). Additional to the pure collection of events, the Event Logging feature supports custom processing (e.g. custom filtering, customer data enrichment/reduction), aggregation, signing and also server side custom pre- and post-processing of events - e.g. to send them to an intrusion detection system or to any other kind of potential higher level log processing /management system. Kibana (http://www.elasticsearch.org/overview/kibana) is a browser based analytics and search interface to logstash and other timestamped data sets stored in ElasticSearch. Kibana strives to be easy to get started with, while also being flexible and powerful, just like logstash and ElasticSearch. 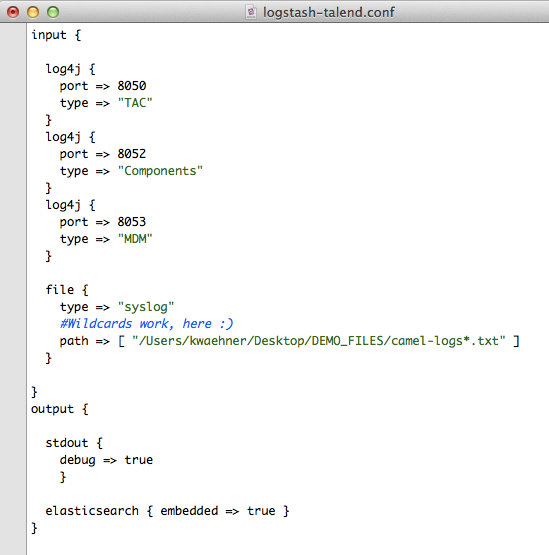 Therefore, logstash, Elasticsearch and Kibana are a perfect combination. You can use Kibana to analyze and monitor your data as you do with logstash, however, Kibana’s web interface is much more powerful and comfortable than logstash. There is a great book about logstash: “The logstash book” – for just 9.99 USD. I can really recommend this book for getting started: http://www.logstashbook.com/. For Elasticsearch, you can find several books on Amazon. Unfortunately, Kibana has no good and extensive documentation yet. I heard from its developers that this topic is addressed for Q1 2014. By default, you see fields such as message, source, timestamp, type, and others. Of course, you can also add custom fields suitable for your business case. This way, you have a central monitoring capability which allows analyzing data on distributed clusters easily. In this example, there are three log4j inputs and one file input. I use the file input to analyze text files in a specific directory. In this case, output is an embedded Elasticsearch instance. In production, you should use an external Elasticsearch cluster, of course. Processing such as filtering can also be configured in this file. Thus, you can process, analyze and monitor all your different inputs within one central monitoring application thanks to Kibana. This is just one example (part of Talend’s DI demos which are included in every DI installation). The job generates some random data and stores it to a CSV file. You just have to add the configured file or directory of tFileOutputDelimited to your logstash configuration using file input (with wild cards for more complex scenarios). That’s it. You can now monitor and analyze the business data in realtime. This example showed a Talend DI Job (i.e. ETL job). However, you can also monitor your business data from SOAP / REST Web Services or Talend Routes the same way.